Pluto, our solar system’s lovably puny outlier and everyone’s favorite demoted planet, is less puny than scientists predicted. NASA’s nuclear-powered New Horizons probe traveled over 3 billion miles in a decade to bring us this new info. Apparently, Pluto’s diameter is closer to around 1,473 miles (2,370 km), which is about 50 miles (80 km) more than previous estimates. “A ha!” you say. 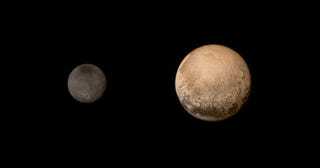 “Give Pluto back its membership! It’s a real planet after all!” I mean, if it’s bigger, that counts for something, right? Wrong. Unfortunately, when five percent of the world’s astronomers voted to reclassify Pluto back in 2006, it wasn’t because of the outermost rock’s size. It was because of the fact that Pluto shares its vicinity in space with other objects, like “plutinos.” They’re too small to be considered planets themselves, but along with Pluto, they crowd an area known as the Kuiper Belt. The other eight planets have “cleared the neighborhood” around their orbits. The good news is that this “settles the debate about the largest object in the Kuiper Belt,” said Alan Stern, New Horizons Principal Investigator, in a NASA video. Nice to know Pluto’s considered BMOC somewhere in the galaxy.